The 1/1,000th of a second is much important for some people and machines on the earth. A car racing driver may lose his world championship or athletes like Usain bolt may loose their world records, if they do not finish ahead other competitors even for 1/1,000th of a second lead. The same thing goes to extreme machines like fighter jets, space shuttles and bullet trains where micro and milliseconds decide the success factor and safety. If you thing who will take care of the importance of such precision time measurement, TAG Heuer will give answer to your questions. 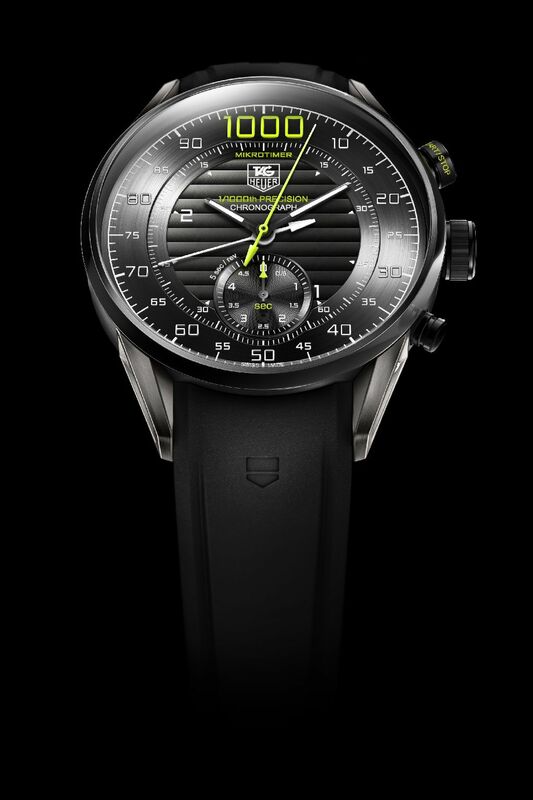 Since its establishment in 1860, TAG Heuer has pioneered, mastered and dominated high-frequency timing and chronographs. In 1916, Heuer introduced the 1/100th Mikrograph stopwatch. With the Calibre 360 in 2005, TAG Heuer introduced the first-ever wrist mechanical chronograph measuring and displaying 1/100th of a second. In January 2011, TAG Heuer went one step further with the Heuer CARRERA MIKROGRAPH 1/100th Second Chronograph, the first-ever wrist mechanical chronograph with a foudroyante central hand displaying 1/100th of a second. The story is not ending here. At Basel world 2011, TAG Heuer unveiled their latest Mikrotimer Flying 1000 Concept Chronograph, the world’s first-ever mechanical chronograph to measure and display the 1/1,000th of a second – making it 125 times more accurate than most existing mechanical chronographs and 10 times faster than the recently launched Heuer Carrera Mikrograph 1/100th Second. As in race car construction, the principal concern in chronograph engineering is precision, speed and readability. This is determined by the chronograph’s oscillating power and construction. Traditionally, oscillators used in chronograph manufacturing beat at 3, 4 or 5Hz, which is the equivalent of 21,600, 28,800, 36,000 beats per hour respectively. Both the TAG Heuer Calibre 360 launched in 2005 and The Heuer CARRERA MIKROGRAPH 1/100th Second Chronograph launched in January 2011 are equipped with 50Hz oscillators – ten times faster than the fastest conventional ones. They are to this day the 1st and only ever and have been commercialized since late 2005 for the former and mid 2011 for the later. – Regular time: 4Hz, 28,800 beats per hour, 42-hour power reserve. – Ultra fast time: 500 Hz, 3,600,000 beats per hour. 1) There is no balance wheel system (patent pending). Its absence de facto eliminates all forms of isochronous errors normally caused by this conventional watch movement component, such as dilatation and inertial imperfection. 2) The mechanical regulating body, a high frequency 500Hz spiral (patent pending), developed together with Swiss watch component high-end manufacturer Atokalpa, is conceptually based on existing spirals but with an optimized rigidity and a reduced length. This gives static stability and extremely high dynamism with limited dilation. It also reduces gravity effects and shocks, while its low amplitude increases the isochronous precision of the pulse. 4) Unlike the self-starting balance wheel-spiral systems usually found watches, the Mikrotimer Flying 1000 Concept Chronograph uses a Launcher-Hub-Brake system (patent pending) controlled by a column wheel and made possible because of the increased rigidity of the spiral. “START” activates the launcher by putting it in solid contact with the radial escapement. “STOP” radially pushes the launcher onto the hub, instantly stopping the movement of the spring. The TAG Heuer Mikrograph 1/100th of a second Chronograph combines two independent kinematic chains — one for the watch and one for the chronograph, thereby eliminating the need for a clutch. The system displays 1/100ths of a second on the central hand and beats at a very high frequency of 360,000 vibrations per hour. Separating the watch chain from the chronograph chain eliminates the risks of the chronograph influencing the watch and vice-versa; but most importantly, it reduces energy loss and optimizes the precision of the chronograph’s regulating organ. It allows the Heuer CARRERA MIKROGRAPH 1/100th Second Chronograph to be COSC across the board — i.e. with the chronograph function running, a feat virtually impossible to achieve by conventional mono-frequency chronographs. The Mikrotimer Flying 1000 Concept is an integrated chronograph using this same atent-pending two-chain architecture. The changes to the regulating body, however, make it 10 times more accurate than the Heuer CARRERA MIKROGRAPH 1/100th Second Chronograph — and 125 times more accurate than the fastest “high-end” oscillators found in most existing mechanical chronographs. Creating a mechanical chronograph that measures 1/1,000th of a second requires serious engineering. Making it easy to read — 10ths, 100ths, 1,000ths and minutes at a glance — requires even more. The flying central hand of the Mikrotimer Flying 1000 makes an astounding 10 rotations per second, indicating 1/1000th of a second and 1/100th of a second on a scale on the external part of the dial, which has 100 graduations over 360°. A second, smaller central hand indicates minutes (TAG Heuer Patent pending) and 1/12th of a minute on a 150-second scale. A counter at 6 o’clock displays 1/10th of a second, calibrated to 5 seconds. 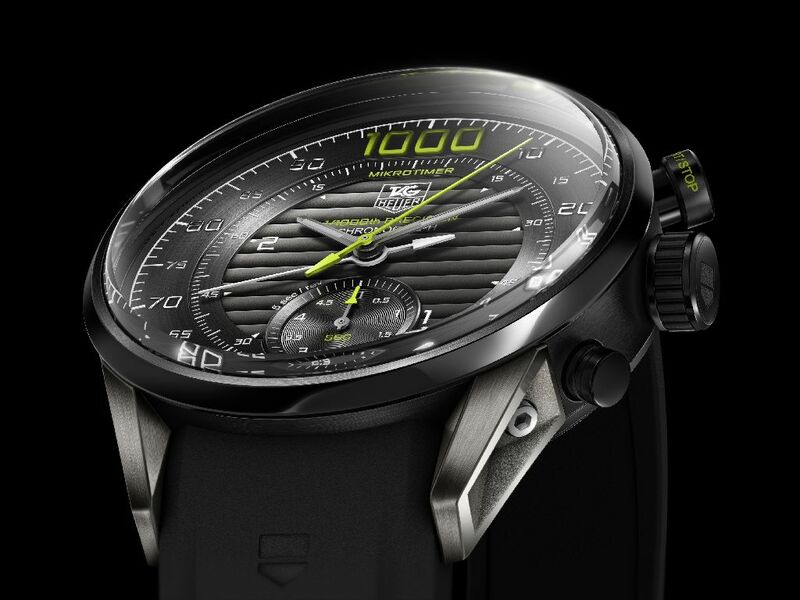 This unique dial-scale display system allows direct, instantaneous reading of minutes, seconds and 1/1,000th , making this the only mechanical chronograph for sporting events like the Formula 1, where 1,000-of-a-second accuracy is essential. Above and beyond everything, it is one of the most stunning “Grande Complication” ever developed in mechanical watchmaking. Stunningly beautiful, with its black Titanium Carbide coated case with titanium horns and the black ruthenium-treated movement inside, the Mikrotimer Flying 1000 is still in the Concept Stage. – Black & yellow chronograph hands.